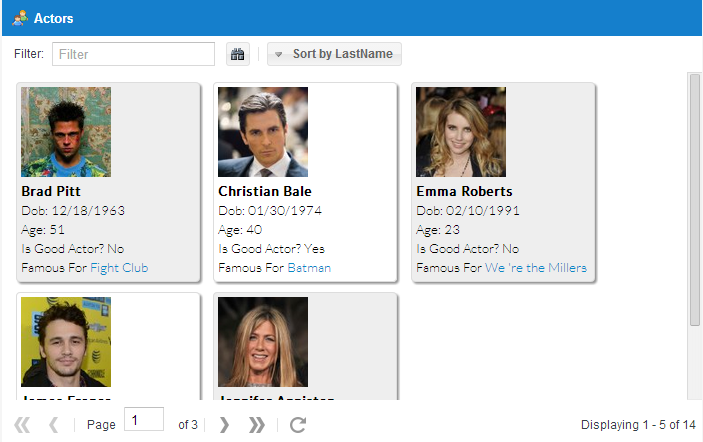 This is a list displaying information for some famous actors in a specific format. Notice the functionality that the list offers. Each time you click to see next or previous page, the list receives only the respective data. If you wish you can ommit the previous addition because when you installed the framework, this assembly was registered for all of your web forms in the Web.config file. Add the following style link inside the head elemenet, so you can use some of the available Ext.NET themes in your application. 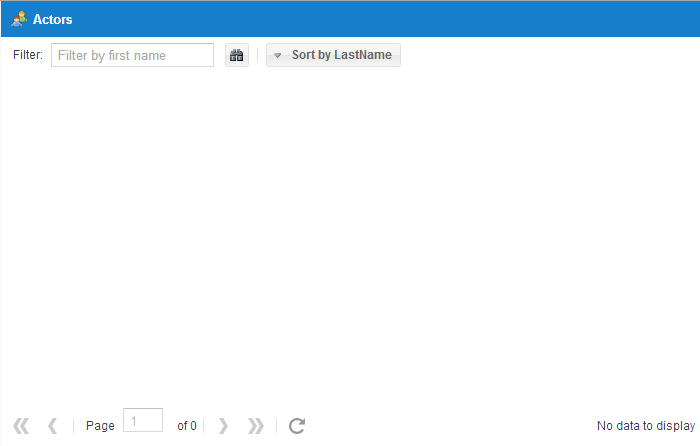 The last thing you must do is to add a ResourceManager control in your page. Without it you won’t be able to use the controls. Add it after the body element as follow. One of the most used Ext.NET controls is the Panel control. The Panel is a container control which means it may have many other controls inside it. Add the following code after the ResourceManager control. If you build and run this page, here is what you have. The above code is quite self explanatory but let’s point out the most important things we did. A Panel may have an Items collection, which is the items you want to be dislayed insided it. They may be buttons, grid, treelist, comboboxes or anything else you can imagine. Outside the Items collection you can add the so called ToolBars. Here we have added a BottomBar with a Pager control insided it. The StoreID parameter is what we are going to discuss now. If you are an MVC developer you will certainly be aware of the Model-View-Controller achitecture. 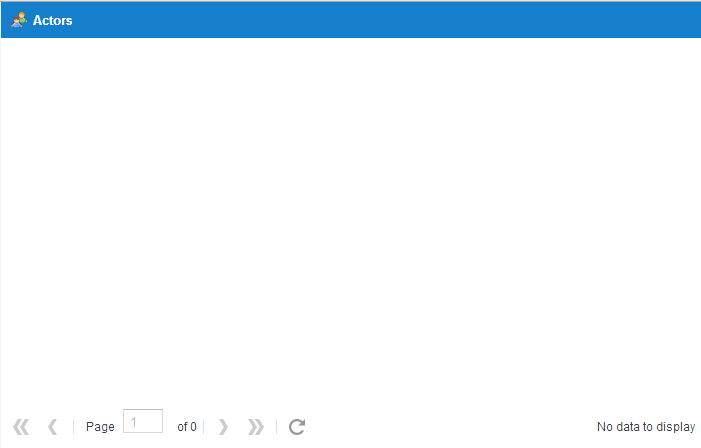 Well.. this is what the Ext.NET Store control try to build. In a Store control, you define the Model and the Controller. The controller is represented by a Proxy control and the Model by a Model one. The model represents the type of data you expect to display. Take a look at the following model we will use. The ModelField elements will correspond to a relative class properties which we are going to create later. The IDProperty is the unique identifier for a Model record. In fact, let’s go ahead and create the Actor class right now. Now back to the Store. We have to define a Proxy which describes how and where are our data retrieved from (Controller). There are many types of Proxy but here we will use an AjaxProxy which says that our data will be fetched though an Ajax requests. You use this type of Proxy when you have a large amount of data to be displayed. If you had less data, you could use a PageProxy that would fetch all the data in the page at once. As you can see, we are going to retrieve our data through an ASMX web service named CustomService. A Store control lives inside a container, which in our case is a ext:DataView control. In this control, apart from the Store control which as we mentioned describes the Model and the Proxy (Controller), lives the Template control which in turn, describes the View or in other words, how we want to render our model. As you will see you can add any HTML elements you want. Quite easy to understand. As we have mentioned, we want to be able to search for specific actors by their first name and sorting them by their last name as well. To achieve that, we will add a TopBar element to the Panel as follow. The second button calls the build in sort Ext JS function function for Store objects. Having said all that interesting things, here is the complete code for the Web Form page. Before running it we need to create the Web Service we mentioned that the Store object depends on. Add a new ASMX Web Service named “CustomService.asmx” in your application. Make sure you uncomment the [ScriptService] attribute line above the class declaration so you can call it from script. Add a list of Actor objects as follow. FamousFor = "We 're the Millers"
FamousFor = "V for Venetta"
FamousFor = "Lost in Translation"
Let us recapture how our Proxy object retrieves the actor objects. We need to add a GetActors WebMethod in the CustomService web service. The GetData() function simply checks what exactly want to do and retrieves the respective data. That’s it, we are ready to go (you may have to clink the GIF image below to see it working). 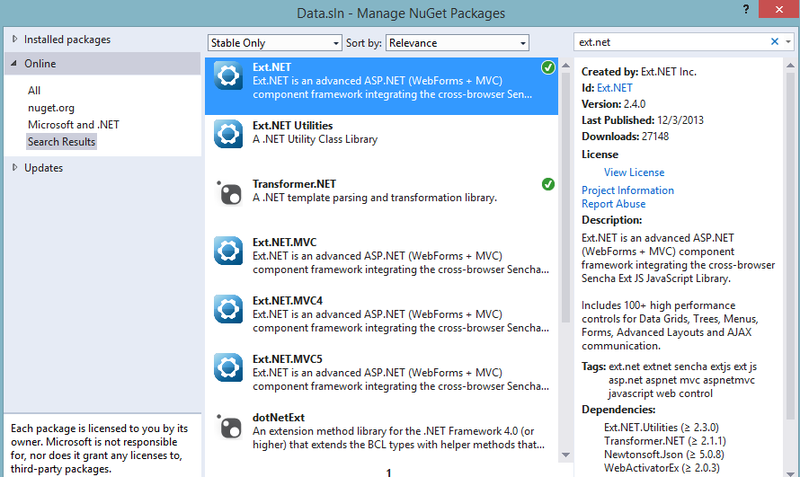 I hope you have enjoyed this Ext.NET introduction cause there are going to be many posts for this framework. You can download the project we created from here (as i have mentioned you need to install the Ext.NET framework by yourself to compile).